Recently I reviewed the new MiniArt British Armoured Car Crew Here on Armorama. Following on from that, here is an In Box look at the first set of 1/35 plastic injection Tank Crew figures, the first generic set of British/Commonwealth plastic Tankers ever as far as I know. For many years modellers of British and Commonwealth armour have been calling for both tankers and vehicle crews, a plea that often fell on deaf ears until very recently when MiniArt took up the call. After many, many years in the wilderness, manufacturers are now producing a whole new range of 1/35 figures and vehicles for this genre. I think MiniArt deserve our full support for leading the way with a range of new British and Commonwealth kits. This set contains 56 parts moulded in light grey plastic. Depicted on the box top is a nice colour image of the 5 painted figures signed A Kapawyk (Andrey Karaschuk) 2008 whom I assume sculpted the figures, but that is a guess on my part. On the bottom is a very clear colour building and painting guide. Painting suggestions cover 8 of the more well know paint manufacturers paints which is a nice touch. The box measures 10” by 6 1/2” approx which is quite large and seems the standard size used by MiniArt for their figures. The figures are contained on 2 sprues that come sealed in a clear plastic bag. Also in the box is a small paper insert depicting the sprue parts and numbers corresponding to the build instructions on the reverse of the box. The figures depict armoured crewmen from 1944 onwards. All are clothed in the light denim tank suit that was issued 2 per man to every armoured vehicle crewman, including crews of the Royal Engineers and Royal Artillery, so there is a lot of scope for usage here. This figure depicts a crewman in the process of mounting a tank via the front glacial plate. The example I’ve see him used on was a Sherman. The figure consists of 9 parts; arms, legs, upper body, head and beret with pistol holster and pouch. Dressed in the Light Denim Tank suit, the moulding is much freer of flash than the armoured car crew set. The garment is well depicted having the correct arrangement of pockets and fastenings and the overall figure has nice creases and natural fold details in the uniform. The suit is open at the neck, and when built and painted this figure should produce a very useable crewman. Around the waist the figure wears a 37 pattern belt with a RAC Corps Mk I pistol holster. This is the style with the long thigh strap and the leg tie down and open topped pistol holster. The strap and a pistol lanyard are moulded to the right leg, as is the tie down. The holster and pistol handle come as a separate item and are quite well depicted, a small ammo pouch rounds this out. 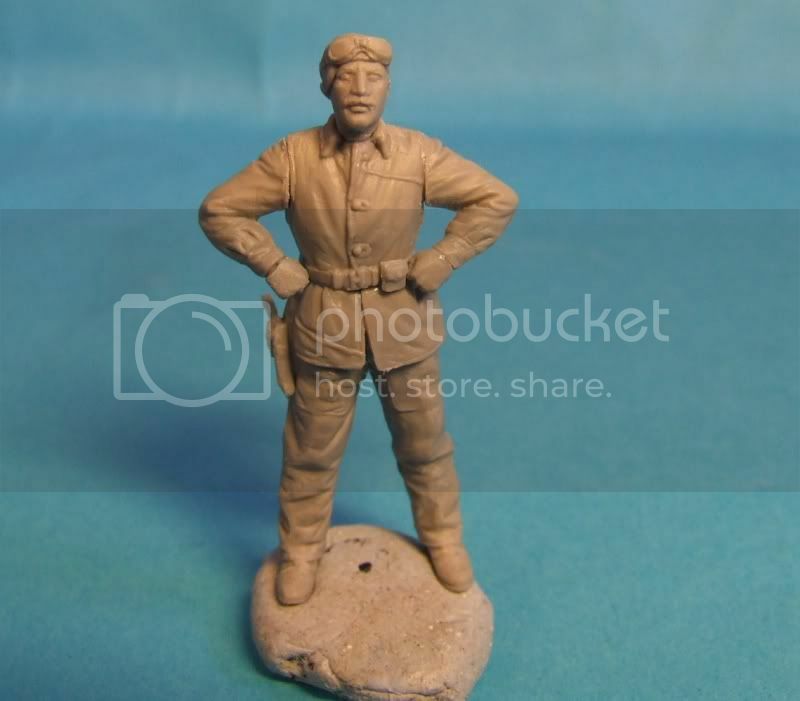 To complete the figure is a separate head, very nicely done with the face of quite a stern looking fellow, along with a tankers beret. This figure depicts a crewman in a sitting position with the left leg designed to be inside a tank and the right leg bent resting on the cupola edge. The example I’ve see him used on was also a Sherman. The figure consists of 10 parts; arms, separate left hand. legs, upper body, head complete with beret, with a pistol holster and separate earphones. Dressed again in the Light Denim Tank suit, the garment is well depicted having the correct arrangement of pockets and fastenings and the overall figure has nice crease and natural fold details in the uniform. The suit is also open at the neck, and when built and painted this figure should produce a very useable crewman. Around the waist the figure wears a 37 pattern belt with a RAC Corps Mk II pistol holster. This is the style with the holster flap. To complete the figure is a separate head complete with beret. This head also has reasonably good facial detail, and to add to the head you get 2 separate earphones. This figure is also dressed in the Light Denim Tank suit, this time wearing a British warm leather jerkin over the top. The garment is well depicted, as is the exposed part of the Denim Tank suit. Around the waist the figure wears a 37 pattern belt with a RAC Corps Mk I pistol holster. This is the style with the long thigh strap and the leg tie down and open toped pistol holster. The strap and a pistol lanyard are moulded to the right leg, as is the tie down. The holster and pistol handle come as a separate item are quite well depicted, and to accompany that you also get a small ammo pouch. To complete the figure is a separate head complete with beret and goggles. The face and beret are well done, and this chap sports a moustache, the box art showing him with Officers brown boots. This figure depicts a crewman in a standing position, head slightly bowed holding a map board in his left hand and a radio handset in his right. The figure consists of 14 parts; arms, separate right hand, legs, upper body, head, tankers helmet, goggles, map board, pistol holster and small ammo pouch and separate earphones. This figure is dressed as the others in the Light Denim Tank suit with all the correct detail being in place. Around the waist the figure wears a 37 pattern belt with a RAC Corps Mk I pistol holster. This is the style with the long thigh strap and the leg tie down and open toped pistol holster. The strap and a pistol lanyard are moulded to the right leg, as is the tie down. The holster and pistol handle come as a separate item and are quite well depicted and a small ammo pouch is once again included. To complete the figure is a separate head, tankers helmet and goggles. The head has quite good facial features, the addition of a tankers helmet and goggles a nice touch, and the map board gives a very good representation of this bit of kit. 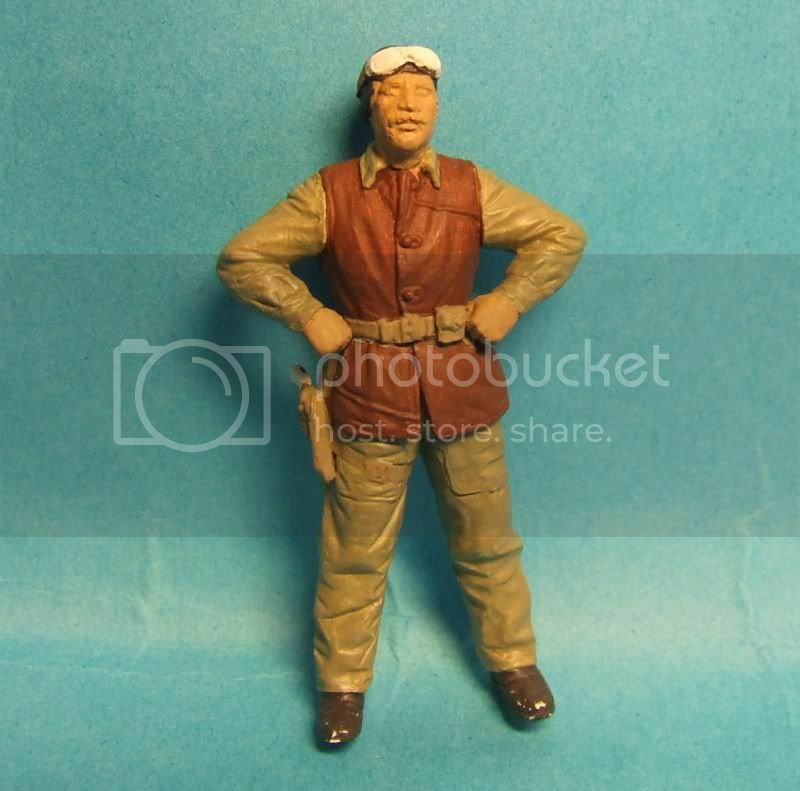 This figure depicts a crewman in a sitting position leaning forward slightly, right hand on hip and the left holding a radio handset. The legs are designed to hang inside the cupola of a tank. The figure consists of 13 parts; arms, separate left hand, legs, upper body, head, tankers helmet, goggles, map board, pistol holster and small ammo pouch and separate earphones. Dressed again in the Light Denim Tank suit with all the correct detail being in place. Around the waist the figure wears a 37 pattern belt with a RAC Corps Mk II pistol holster. This is the style with the short strap. The holster and pistol handle come as a separate item and are quite well depicted and to accompany that you also get a small ammo pouch. 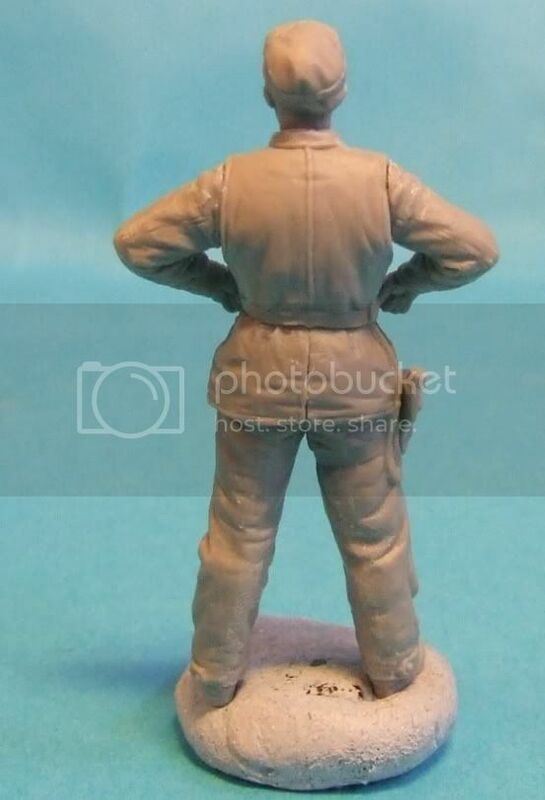 To complete the figure is a separate head, tankers helmet and goggles. The head has quite good facial features, the addition of a tankers helmet and goggles a nice touch, as are the earphones. There are some differences between the Box Art and the Figures. Figure A is shown with his sleeves slightly rolled up, but the figure actually has full length sleeves. Three of the crew have the early style Mk I pistol holster with the long thigh strap. Although still used by some individuals, this style had by 1944 given way to the shortened thigh strap of the Mk II holster. The moulding and detail on the figures is very good, the uniforms look correct with the right pockets and fastenings, all well depicted with nice folds and creases. There will be the usual seam lines and some flash to clean up, but overall the level of detail is very good indeed. The 37 pattern belts are shown without the rear buckles and I cannot comment on the front brasses until the figures are cleaned up and built. All the tankers wear ammo boots that are fairly well done. A really useful set of generic tankers, that could be used as a complete crew, individually or in pairs. Finally after many years there is available a set of British/Commonwealth Tankers at an affordable price. I am glad to see the use of the Lightweight Denim Tank Suit, an order of dress that is not often depicted, and hopeful that these will prove both a useful and popular item with modellers. MiniArt are to be congratulated for the effort put into these figures, the Mk I pistol holsters, whilst looking somewhat cool, weren’t really all that common by 1944, and I would have preferred the Mk II shortened version or the flapped holster instead. Whether you are building a stand alone vehicle or a small diorama these figures should prove very useful for the British/Commonwealth modeller and are a great plus to the range of 1/35 plastic figures currently available. I for one am delighted to see this set and I hope it gets the support it deserves and that MiniArt will then consider a further set of British tankers.... say in battle dress! Highs: British Tankers in Plastic, just brilliant. Great level of detail for plastic injection figures and a very useable set. Lows: For some, the Mk I holster will be inappropriate. Back again! I don't have the book you are referring to, but on p.43 of "British Sherman Tanks" by Dennis Oliver (Concord), there is a pic of two crewmen holding a nazi flag and the one on the left looks like he's wearing coveralls to me, and has corporals stripes on the sleeves Anyway, here are some pics of the unpainted figure after a bit of clean-up (still needs a touch of filler), before I prime him this afternoon. Hi Michael, not sure what you mean by "flat clearing"? Gotcha! Yes, there is a semi-gloss finish on the paints (I tend to use Humbrol & White Ensign Enamels), and I will be adding a matt coat to them (I tend to use Tamiya flat mixed ~50/50 with Future/Klear for brush painting). Apart from the leather jerkin which will have a slight sheen of course. No. Lend Lease was NEVER provided to Poland so it's completely incorrect to use that term. With the formation of the (Exiled) Polish units in Britain from 1940 onwards, British equipment & Uniforms were issued to ALL personnel. The only difference you'd find wre in areas such as details of Officer's Dress Uniforms where they tried to keep their uniform traditions alive. Standard uniform was exactly that - as would be seen in ANY British Regiment. Only difference would be in Unit/Regimental flashes. Same goes for the Polish Forces who served with the Red Army - Soviet Uniforms, Soviet vehicles equipment etc.